The old Redbox business has started to fade, the new ecoATM idea might not have legs after all, and new CEO Erik Prusch faces a tough turnaround task. 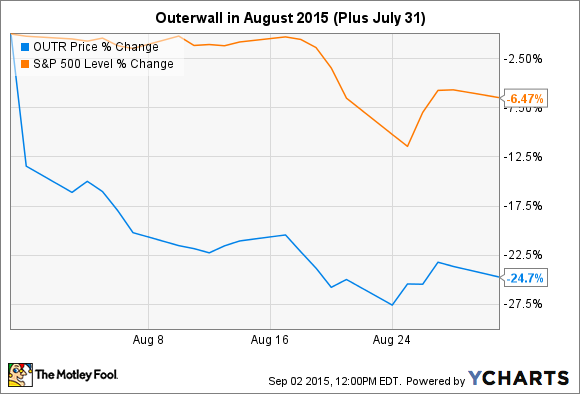 What: Shares of Outerwall (NASDAQ:OUTR) fell 13% in August, according to data from S&P Capital IQ. The sell-off was sparked by a second-quarter report published right at the end of July. If you include the 13% plunge on July 31 that followed that report, you'd be looking at a 24.7% drop over 32 days. So what: The report presented strong earnings but disappointing revenues, and Outerwall's refreshed full-year guidance followed along the same lines. After six months under an interim CEO, the company also picked a new name for the corner office. Erik Prusch, former CEO of wireless data network Clearwire, picked up the reins. Beyond these late-July events, Outerwall shares continued to fall only slightly faster than the S&P 500 market tracker, only dropping a little bit faster when the traditional media industry took a collective hit in the first week of August. Now what: As parent company of DVD rental kiosk operator Redbox, Outerwall is rightly seen as an increasingly obsolete remnant from a fading entertainment era. Redbox represents more than 80% of Outerwall's annual revenues these days, but the company recently closed its Canadian Redbox operations and plans to remove roughly 1,500 American kiosks by the end of the year. DVD and Blu-ray rentals are starting to look quaintly outdated in this increasingly digital era. That explains why Outerwall shares followed the traditional media giants downward in early August, when a cluster of that industry's earning reports showed a growing number of cord cutters. Outerwall has tried its hand at digital streaming services and failed miserably. The rise of all-digital entertainment options is terrifying for a company that relies on the closest thing to old-school movie rentals that we have today. It should be noted that Prusch indeed brings experience from similarly desperate business environments. Shackled to a losing wireless communications standard, Clearwire ran out of options and ultimately had to settle for a lowball buyout. At $5 per share, investors who had picked up Clearwire shares for as much as $8 a stub three years earlier walked away disappointed. Prusch led Clearwire into that whimper of an exit, and here he is again. As the Redbox business slowly fades to black, Outerwall has shifted its focus to ecoATM. These kiosks let you recycle your old cell phones and tablets for a modest payment. Even that Hail Mary pass might fail, since the 9% year-over-year revenue growth in the segment was powered by proliferation kiosks -- but faced lower trade-in volumes per location and lower device values as well. It's up to Prusch to make the ecoATM idea work or come up with a new plan. In August, Outerwall investors didn't exactly give him a strong vote of confidence.